Elimination of SALT deduction would make D.C. less desirable relative to several other counties in the metro area, making the city less attractive for future residents. Many have written on the State and Local Tax (SALT) deduction, including our own David Brunori, who points out that SALT deduction is regressive (although the overall package is not: it transfers from future generations to the current generation). Iris Lav and Micheal Leachman of the Center for Budget Priorities argue that the elimination of SALT deduction is effectively the end of a de facto revenue sharing agreement between states and federal government. It is a polite way to describe the implications of SALT deductions—as it is not clear that the Federal government ever intended to help states raise revenue, but it is correct. When D.C. raises taxes by $1, each resident’s federal AGI declines by $1, and the net impact on the residents’ bottom line is tempered by their effective federal tax rates. (See a more detailed explanation here). Same sentiments can be found here, here and here (the latter two, gated). The bigger tension here is that with SALT deduction embedded in the federal tax law, any tax regime that makes the state and local taxes more progressive makes the federal taxes more regressive, and vice versa. If one’s focus is redistribution at the national level, then SALT deduction is not particularly good. Josh McCabe points out that the high-income taxpayers from three states – California, New York, and New Jersey—claimed a third of the SALT deductions, and he argues this comes at the expense of federal spending on the poor (though we would have to keep the faith that any additional federal spending will go to the poor.) Reihan Salam takes the argument even further, arguing that eliminating the SALT deduction will strengthen federal programs for the poor. But if he were right, why didn’t we see more of this kind of support for the poor in this tax package? Why should federalism be stronger by expenditure side interventions, and not by tax side interventions? Mr. Salam calls the increased federal spending in social programs a “logical corollary,” (is there another kind?) and if we were to believe him, then we should conclude that recent remarks from Congressional leadership about reducing entitlements defies logic. Yet, this is an interesting point for D.C. as we (a) are in the center of a highly mobile metropolitan area with very different income tax rates, and (b) have a highly transient population meaning our future population not only relies on who stays in the city but also very heavily on who, in the future, decides to move in the city. 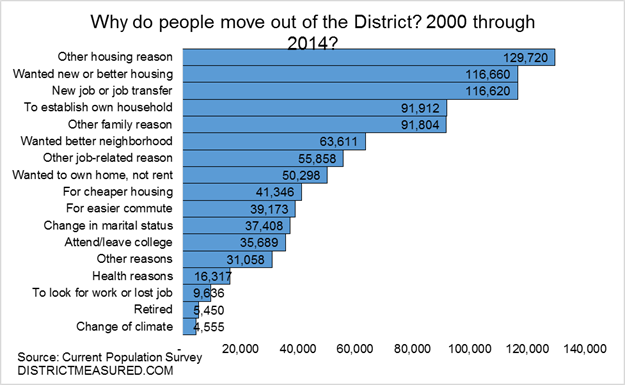 Who in D.C. will be most affected? According to IRS data for 2015, D.C. residents with incomes over $200,000 were 8 percent of all federal income tax filers, earned 48 percent of all District income reported at the federal level, and paid 64 percent of federal income taxes paid in the District. More to the point, high income taxpayers itemized much more frequently (43 percent of itemized deductions are reported by those with an adjusted gross income of $200,000 or more) and they also reported a much larger share of itemized state and local income taxes (56 percent). The District has changed its income tax regime many times since Home Rule. Until 2006, the top bracket began at $20,000; that is, the District’s own income tax regime was essentially a flat tax regime. We don’t have distributional data on D.C. income taxes for these early years, but according to the IRS data, during this period, high-income earners (those with $200,000 or more in income) carried a lower share of the D.C. income tax burdens (yes, not as many people made $200,000 back then). For example, in 1998, the high-income earners made up 42 percent of state and local income taxes itemized as deductions on all D.C. tax returns. The top bracket went up to $40,000 in 2006 (with a top rate 8.7 of percent in 2006, and reduced to 8.5 percent in 2007). We added another bracket right after the Great Recession in 2011 (gross income over $350,000, at 8.95 percent), and then another in 2015 ($1,000,000 or more taxed at 8.95 percent, and the tax rate on incomes between $350,000 to $1,000,000 now taxed at 8.75 percent). Thus, the more progressive we became in D.C., the greater the impact of SALT became for higher earners. Now let’s look at how much these filers itemized: D.C. residents with incomes over $200,000 have, on average, itemized a total of nearly $89,000 in income, followed by residents in Montgomery County, at $76,000. The inner counties of the metro area look similar beyond these two jurisdictions, with itemized deductions of $50,000 to $60,000. One notable exception is Baltimore county (but note that intensity of wealth here is much lower, with only 5 percent of filers in the $200,000 or above category). Similarly, D.C. residents with incomes over $200,000 report the highest state and local income taxes in their Itemized Deductions Schedules at $44,000. The closest in this figure is Montgomery County, which also has a higher tax bracket for its high-income residents. Counties in Northern Virginia, despite being equally wealthy, report almost half of what D.C. residents report. In fact, the differences in itemized deductions can be largely explained in differences in state and local income taxes reported as itemized deductions. For Arlington, for example, the differential income taxes account for 60 percent of the differences between itemized deductions between D.C. and Arlington. For Alexandria, it is 63 percent, and for Montgomery County, it is only 35 percent. What does all this mean for D.C.? After the implementation of the tax package (assuming that the bill that comes out reconciliation does not make changes to the SALT and standard deduction provisions), D.C. residents with incomes over $200,000 would have to report an additional $44,000 in taxable income. Some might switch to the standard deduction, but given that overall itemized deductions are at $88,000, on average, it would still be more advantageous to itemize for the average taxpayer with an income of $200,000 or more. A resident of Arlington, on the other hand, would report an additional $25,000. The total taxes paid by these high-income residents might go down depending on what happens to marginal tax rate and the Alternative Minimum Tax. But the relative tax burdens across counties of the metro area will change, with D.C. becoming less attractive relative to nearby counties in the Metro area. One might say these changes would not be enough to make people move out of the city, and that might be so. But that is not the end of the story. 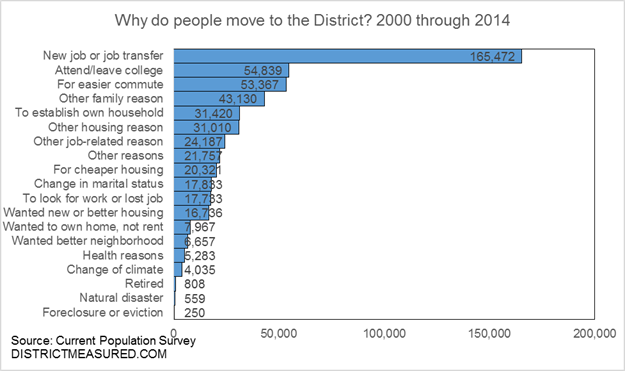 D.C. is a highly transient city, and draws great strength from people who move in to compensate for those who move out. Last year, D.C. was the only jurisdiction among the Metro counties that continued to show a positive increase in net new residents, excluding babies. Under the new federal tax regime, the differences in local income tax rates might be enough to prevent new residents from moving into the city. And these differences will be amplified when the provisions of the tax bill that favor individuals begin to expire in 2027. This is something we should watch carefully. This piece has been updated with minor edits.